This week’s blog is a follow up to a recent post in which I discussed integrating kitchens and living rooms. The premise of the post was that living rooms are underused, and creating a “great room” by combining the kitchen and living room helps the living room get more use and the kitchen gain some much-needed extra space. That post only addressed the advantages of great rooms, so in today’s related post I’m discussing open floor plans and the advantages and disadvantages of having one. This post may inspire you to create an open floor plan during your home remodel, or to make an existing open floor plan into several separate rooms, depending on your household’s needs. This Freshome design has the bedroom open to the rest of the living space and separates it from the kitchen with a glass wall that allows sunlight to permeate throughout the home. Just as the name suggests, a home with this type of layout has one or more large, open rooms that function as multiple rooms within a single living space. 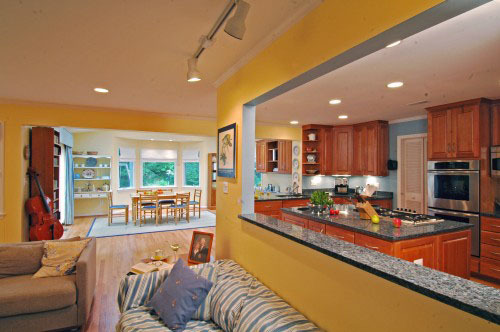 The most common is a “great room” that combines the kitchen, dining room, and living room in one shared space. These floor plans usually work extremely well in homes with less square footage – sometimes out of necessity – while larger homes have more leeway to work with when integrating great rooms into a floor plan. 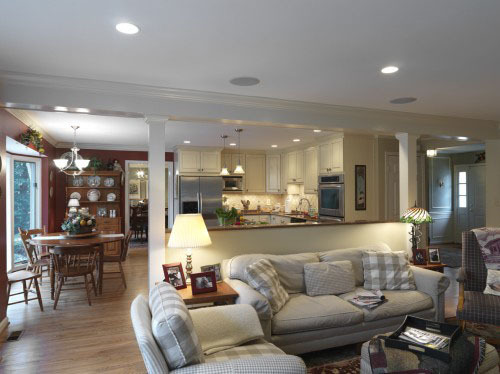 The Case Design/Remodeling remodel of a smaller home’s main level created a great room by removing most of the wall that separated the kitchen and living room. 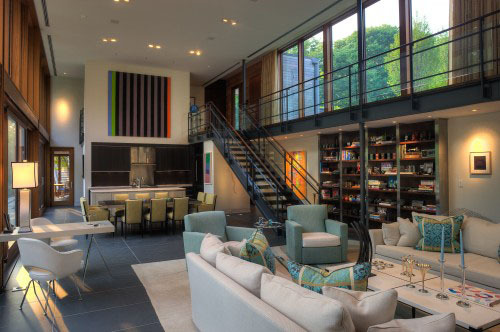 The columns and half wall retain the home’s structural integrity and provide a dividing line between the two rooms. Traditionally, homes built pre-1990s were designed with lots of separate rooms in mind, even though many of these distinct rooms were really only separated by three-quarters of a wall and an open walkway – most often the kitchen, dining room, and living room. The mindset was that the more rooms a house had, the more attractive, compartmentalized, and functional it was. But designers and homeowners alike started realizing that homes with open floor plan designs could fit more usable living space into the same amount of square footage. Fast forward 20 years, and spacious homes with fewer walls are more popular than ever. More social time. The person cooking or cleaning in the kitchen can converse with people in other rooms. Keep an eye on the kids. Great rooms allow parents to cook and do other household duties while their kids play in the same room. Increase views and natural light. The removal of interior walls allows sunlight from windows in the exterior walls to permeate throughout the house. Better for entertaining. When guests are over you can be part of the group while you cook and serve food at the same time. Ziger/Snead Architects designed this great room. The new house was sited to take advantage of the existing grading and so the new great room is located where the former basement was. The design allows natural light into the home throughout the day. Photo credit: Copyright Kevin Weber Photography. Now that I’ve made such a strong case for wall removal you’re probably wondering who in their right mind would choose anything else? Closed floor plans offer a larger number of smaller sized rooms that can provide privacy and organization. This closed living room designed by Nurit Geffen-Batim Studio makes great use of a small, narrow space with plenty of seating, built-in shelves, and storage compartments. More privacy. Many households have people contending with different ages and schedules, from babies to teenagers and grandparents or nannies that all live in the same home. 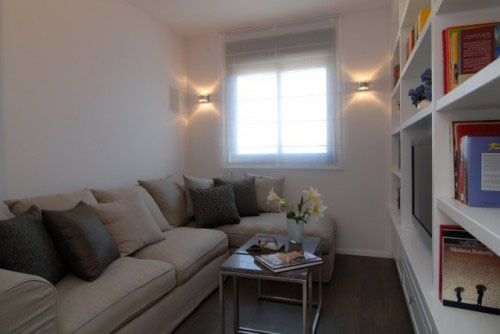 Enclosed spaces may work better in a house where everyone needs their space. More walls for artwork. If you are an art enthusiast and need ample space to display your favorite works you will need wall space. Also, depending upon the delicacy of the work, direct sunlight may damage the art. In this case, walls are a good thing! Easier to clean/contain messes. You may prefer an enclosed playroom for kids or rooms with doors that can keep messes out of the main rooms, making you look and feel like a better housekeeper. 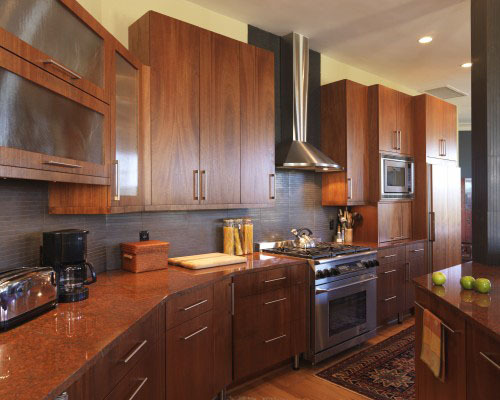 This Case Design/Remodeling kitchen remodel converted an open kitchen to a closed one, creating a larger living and dining area while making the kitchen easier to cook in because the space is more confined, putting all the amenities within arm’s reach. Noise doesn’t travel as far. Open floor plan designs have more acoustics and cause noise to travel further, while extra walls can help contain and limit noise. Specialty rooms. More rooms means more separate spaces dedicated to individual uses, such as home offices, art studios, craft rooms, workout rooms, and guest rooms. A majority of modern homes combine a variety of layout options. It makes sense for most households to maintain a more spacious design on the main level and smaller, separate rooms in the second floor, basement, or attic. It’s easy to see where part or all of the old walls were removed to create a single, unified room in this Case Design/Remodeling remodel. A compromise between open and closed floor plans with structural barriers retains some separation among spaces. Open floor plans sometimes seem to benefit single people or couples without children the most. It’s a way to take advantage of more of the space in the home without having to contend with as many privacy issues. And it’s not like your household needs to pick one or the other. Regardless of your home’s current floor plan, if the layout’s not working for you anymore – and maybe it never really did – it’s time to think about how you can make better use of the existing space. If your existing floor plan isn’t meeting your needs, think about where in the home it can be broken down differently. Most homes benefit from fewer walls in the basement, attic, and/or main level. This design by Jamison Howard combines an open floor plan and plenty of natural light with the contrast of the white interior against dark wood floors to create a particularly light, open, airy feeling. I recommend leaving a main level as one open space – usually referred to as the “great room” – as is whenever possible. It doesn’t usually make sense to separate an open kitchen, living room, and dining room when there are other options available elsewhere in the home. If you need extra bedrooms, a home office, or a creative studio room, these can often be integrated into a finished basement or attic space by adding a couple of walls. Adding a bathroom to a house with an open floor plan can be as easy as borrowing some unused space from a great room or other larger room, although it helps a lot if that space happens to be adjacent to the existing plumbing. I love doing remodels on homes with closed floor plans because it’s fun to play the room rearranging game. You can get lots of ideas for converting your space simply by doing the kind of walk-through that I do during a home remodel consultation. Start by making a prioritized list of the changes you’d like to make in your home. Visit each room in your home individually, making notes about the room’s location, adjacent rooms, natural light, and current uses. How can the room you’re standing in become a better room by combining it with the one next door? A lot of bathroom expansions begin with the realization that a current, cramped bathroom is right next to a small, seldomly used room or linen closet. Two adjacent bedrooms can be combined to create one larger bedroom or office. A garage can be finished and turned into a master bedroom, family room, or entertainment room. This Case Design/Remodeling remodel converted the existing living room into an office/den and borrowed unused room from the remaining floor plan to create an open living room-kitchen. It’s time to get really creative! I encourage these homeowners to look outside their house or apartment, literally, to see what kinds of existing attached outdoor living spaces can be made into indoor living spaces. Decks, patios, sunrooms, and flat roofs are all options. Converting decks or balconies to interior rooms can sometimes add enough extra square footage to the adjoining room. A patio already has the foundation to expand the adjoining room outward. Sunrooms are wonderful because they’re already part of the indoor space and can be combined with adjacent rooms to make the entire house bigger and brighter. A flat roof can be converted into an open deck, covered porch, or even a vegetable garden, to make better use of all your home’s interior and exterior spaces. This remodel by Case Design makes use of every nook and cranny in a smaller home. 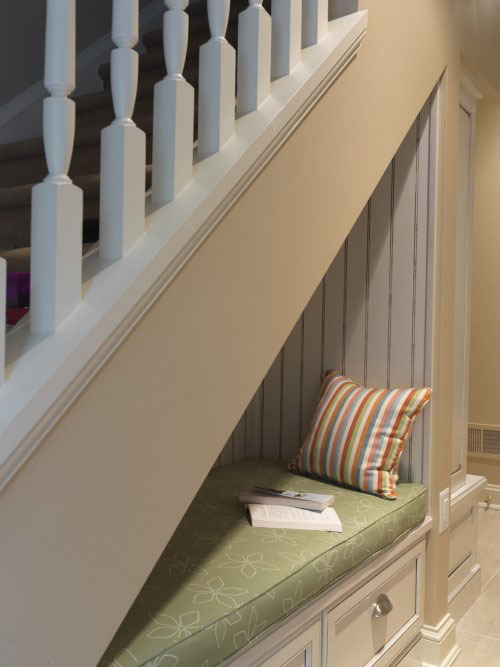 This normally wasted space under the staircase integrates a reading nook and storage in one design. Some smaller homes simply need better organization, and it’s time to look for creative ways to add additional closets, shelves, cabinets, and drawers in every nook, cranny, and unused surface space available. Share with us your own ideas and experiences with converting an open or closed floor plan to the opposite.